Even if you have a current licence, all BizInt Smart Charts software has an expiration date, typically 18 months after the release date. (See table of expiration dates by version) When the software expires, you will not be able to open or create BizInt Smart Charts files. Updating to the latest version will give you access to the latest exports from our publisher partners, new features to help you build better reports, and all of our bug fixes. How do I know when my software will expire? Go the Help menu and select "About BizInt Smart Charts". A window (see below) will appear showing the version number, release date and expiration date at the bottom of the window. This window also appears every time you launch BizInt Smart Charts. You will see warning messages when you launch the software starting six months before the expiration date. When will my software version expire? 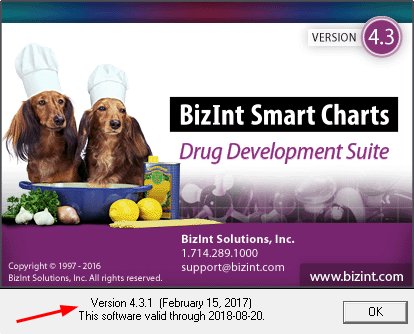 BizInt Smart Charts software expires 18 months after the release date for that version (except for BizInt Smart Charts Viewer which expires 3 years after release). Please note that the expiration date is based on the release date of a particular version, not when the software was installed. The table below lists the expiration date for major releases. You will need your company userid and password to access the download page. Contact us if you need any help upgrading your software. If your software has expired and you are not able to upgrade the software quickly, we can send you a 30 day extension file. You will need to copy this file into the directory where the software is installed. If you do not have admin access to this directory, the only option is to have the software upgraded.